The Agios Georgios Sikousis Society has evolved into the Saint George Sikousis Syllogos. For historical purposes this site will be preserved as is. 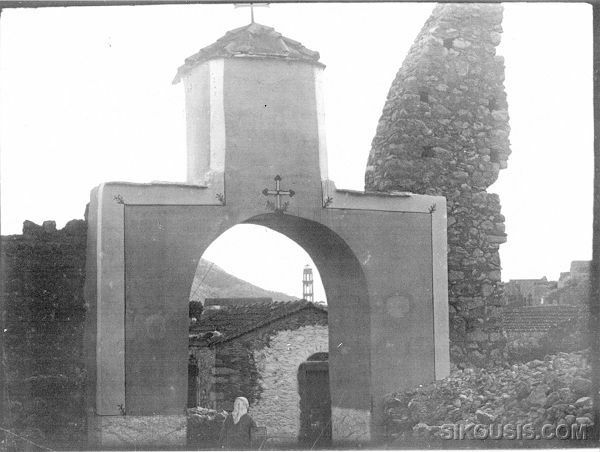 The old entrance to the Agios Georgios Monastery "Stavros". In the background the Agios Panteleimon bell tower can be seen as well as part of the monastery exterior wall that was destroyed during the 1881 earthquake. A 1928 picture by Perikles Papahatzidakis. Following the road that goes through the Kambohora going uphill in a south-western direction one reaches the large village of Agios Georgios Sikousis, built 12 kilometers away from the town of Chios on the top of the hill covered with olive trees. At a short distance from the village lies the area of Makri with the ruins of a medieval castle and the remains of an old church. In the village there is a Byzantine church dedicated to Agios Georgios (Saint George). The church was once the chapel (katholikon) of the monastery built before the Nea Moni. The three venerable founders of the Nea Moni retired to this monastery to lead an ascetic life. It eventually became a dependency of the Nea Moni. The location offers a splendid panoramic view to the east and to this natural platform the plain of Kampos spreads to the sea. The sight continues undisturbed all the way to the coast of Asia Minor. Leaning against the circular wall of an abandoned windmill looking towards the infinite this just feels a unique spiritual serenity. On this site we hope to present information on the village of Agios Georgios Sikousis as well as information on the Agios Georgios Society of America. The Agios Georgios Sikousis Society site presents information in both Greek and English. To visit the Greek version of this site click on the Greek flag here , or on the left menu. If you do not have Greek fonts on your system, please visit, the Hellenic Resources Network to find out how you can install and use Greek fonts with your browser.